SP3. This is a well respected village on the East side of Pattaya. 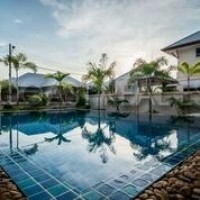 It offers nice wide roads, a very clean community, and communal swimming pool and children’s playground and garden. Set just off from Siam Country Club road it has plenty of surrounding local and international schools, a relaxed Ex Pat area with family orientated activities all around. The house is quite large and open, and sits on a nice landscaped private garden. The owner has really looked after this home and it is very clean, tidy and in impeccable condition. The living room is vast, and split in 3 sections with a living area, TV area and dining area. The lounge is large enough that it even has its own bar!! With 3 generous bedrooms (2 offing en-suite bathrooms) this home is large enough for many families, plus the kitchen is also big enough to cater for a demanding family. There is plenty of storage space around the house, and private off road parking via the electric gates.